Chili-Topped Baked Potatoes Recipe — Pip and Ebby - easy, delicious recipes! 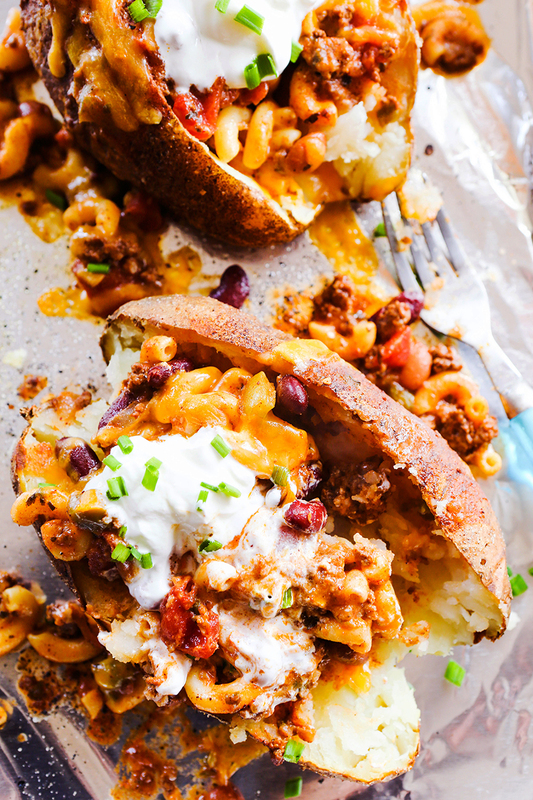 Chili-Topped Baked Potatoes are a great way to use up Chili or Chili Mac leftovers! 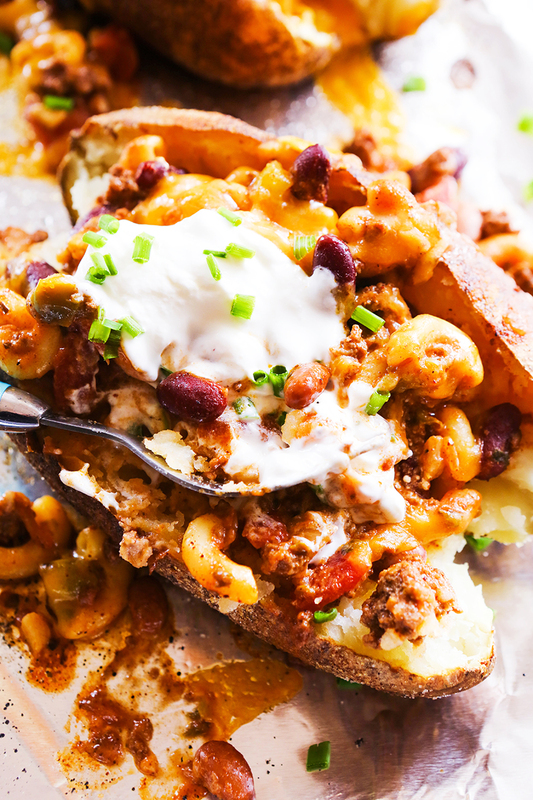 Smother the potato with the delicious flavors of your chili and sour cream and cheese! It’s piling comfort food on top of comfort food for a warm, delicious meal. I'm on a roll with comfort food. It is all I can think about lately. After making another batch of The Best Chili on Earth and then another batch of Chili Mac and Cheese, I went off-the-charts crazy and started throwing both recipes onto Baked Potatoes! I know. Comfort food overload. Except, there's no such thing because you can never have too much comfort food, especially when the wind is howling outside and a fire is crackling nearby. 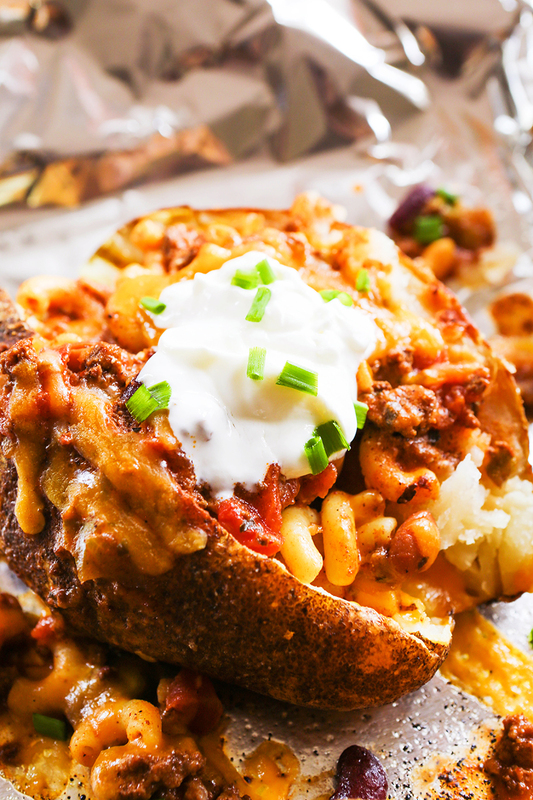 These Chili-Topped Baked Potatoes are SO GOOD. If I could eat any meal every day of my life, this would be it. What would be the meal that YOU could eat every single day of your life? Leave your answer in the comments! I highly recommend using homemade chili to top the potatoes with, but time does not always allow for that (check out my Easy 5-Ingredient Chili for a 30-minute version of homemade chili!). The thing I love most about this recipe is that it is a way to re-purpose chili leftovers. Re-purposing food always feels (and tastes) good. Enjoy! And trust me, you will! Thanks for being here. Don't forget to leave a comment! 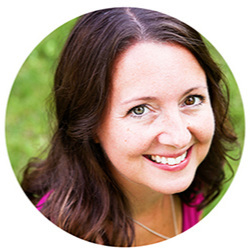 I'm excited to hear about your favorite never-get-old meals. 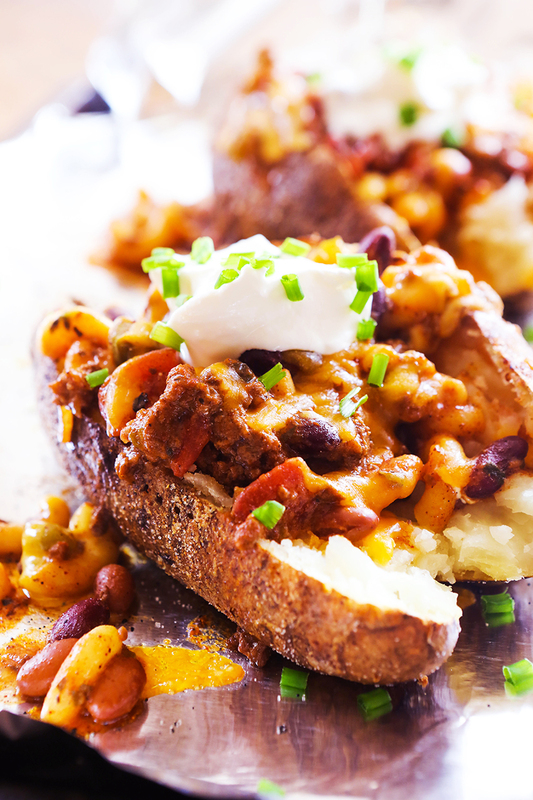 Top your baked potato with chili for comfort food overload! Make the Baked Potatoes: Preheat the oven to 400 degrees F. Run the potatoes under cold water, scrubbing with fingers or a small brush, until clean. Poke holes all around the potatoes using a fork. Rub approximately 1 tablespoon of olive oil over the entire surface of each potato. Coat with seasoned salt and place in the center of a rimmed baking sheet. Bake in the preheated oven for 1 hour, or until a knife or fork can be easily inserted into the centers. During the last 15 minutes of baking the potatoes, heat the Best Chili on Earth in a saucepan over medium heat until simmering. Assemble the potatoes: Remove the potatoes from the oven but keep them on the baking sheet. Cut them down the centers lengthwise. Top each potato with 1 cup of the warmed Chili or Chili Mac and 1/4 cup of the cheese. Return to the oven for 5 minutes, or until cheese is melted. Remove from the oven and top each potato with 2 tablespoons of sour cream and 1 tablespoon of chives. Serve immediately!